Scooters are the most popular vehicles when it comes to travelling within the city. They are easy to go through narrow streets and jam packed roads. If a used scooter is on your list, then Droom is here with an exciting offer right on time. Shop for jaw-dropping scooter deals under Droom Scooter Looter sale. Get ready to shop from the largest collection of verified and inspected scooters from 18th June 2016 to 21st June 2016. Sweep through the city roads in style without shelling out huge amount of money as you get discount up to ₹11,000 on over 2800 scooters. This offer is available in all cities across India like Delhi NCR, Pune, Bangalore, Mumbai, Ahmedabad, Jaipur, and Chennai to name a few. This time, you get the lowest price possible on the widest range of pre-owned scooters. 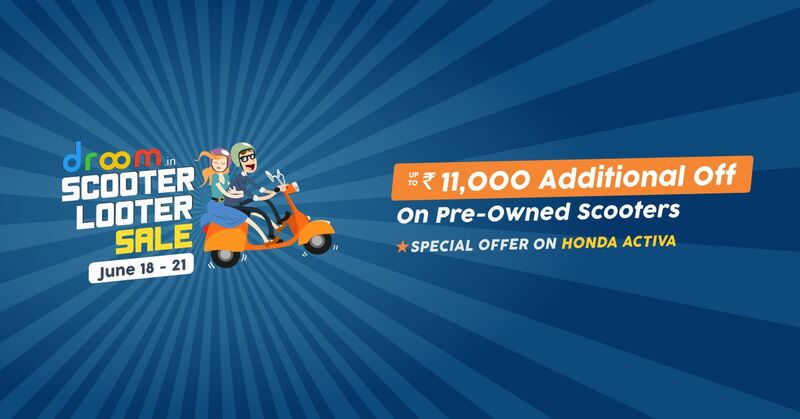 Get up to ₹11,000 off on Honda Activa – the Biggest Blockbuster. Shop for other top trending models like Suzuki Access, Hero Maestro, Honda Dio, TVS Jupiter, Honda Aviator, TVS Wego, and more. It’s been said that four-wheelers move your body and two-wheelers move your soul. Get your scooter and kiss the air. Scooters are best friend to roam around the phentermine city. They offer easy and comfortable ride to riders of any age (age 18 above). Sleek design and lightweight make it easier to commute even during busy traffic hours. Quickly get your own set of wheels and score all the attention. Hurry! Pay token amount now and be the proud owner of your dream scooter. Visit now to check these hard to miss deals. Also keep coming back here for more offers on used motorcycles, scooters and cars.